Since 2015 GDP growth has slowed due to decreased commodity prices, but the external economic position remains solid and the liquidity position sound. For more than five decades Colombia’s state authority has been challenged by (drug-financed) guerrilla groups. After several years of negotiations in November 2016 a peace accord between the Colombian government and the main guerrilla group FARC was finally ratified by Congress. While this seems to be a milestone improvement of the country´s security situation, domestically the government has been widely criticised due to some major concessions it made (in October 2016 a referendum on the original accord was rejected by voters, and as a consequence several major alterations had to be made). Given the on-going opposition against the peace accord, its full implementation is still not granted. 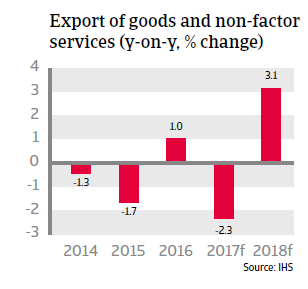 Since 2015 Colombia´s GDP growth has slowed down due to decreasing commodity prices (commodities like coal and oil account for 80% of Colombian exports, with oil alone accounting for more than 40%). 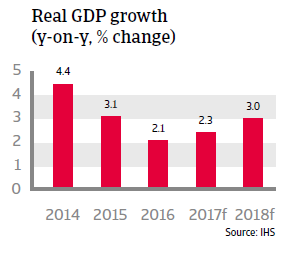 In 2017 the growth outlook remains modest (up about 2%), followed by a 3% rebound in 2018. Inflation increased in 2015 and H1 of 2016, triggered by currency depreciation. The Central Bank repeatedly increased the benchmark interest rate to contain inflation since September 2015, and due to this monetary tightening inflation started to decrease again since August 2016. This has enabled the Central Bank to lower interest rates again in late 2016 and early 2017 in order to support economic expansion. 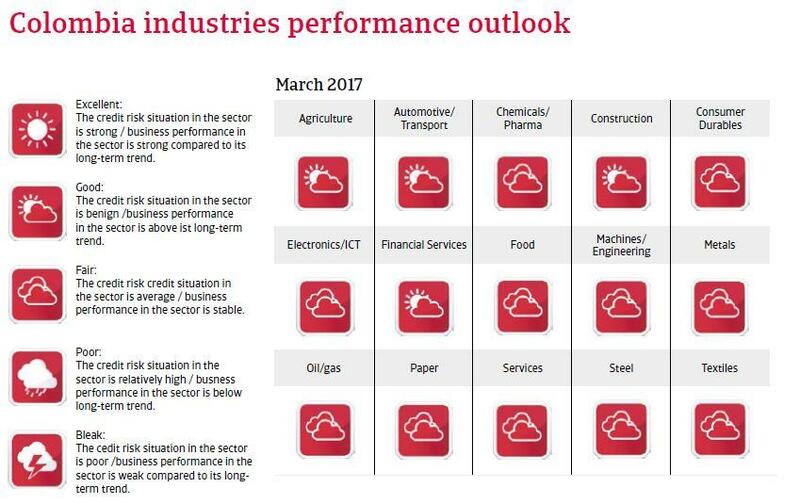 Banks´ profitability, capital adequacy and credit quality have only mildly been impacted by low oil prices and a weaker economy. Capital adequacy ratio and non-performing loans remained stable in 2016, at about 17% and 3% respectively. In recent years sound economic policies have contributed to higher earnings capacity and economic resilience. 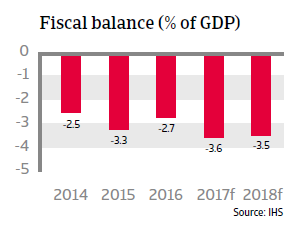 The fiscal deficit has widened due to lower oil revenues, but not to a very large extent, and while government debt is rising (set to peak at about 50% of GDP), sustainability is not at risk. Most of the debt is financed domestically and long-term, at fixed rates. Colombia’s external economic position remains solid. The government accounts for about 60% of Colombia´s external debt, and while foreign debt and debt service ratios have increased due to currency depreciation and decreasing export receipts, risks are mitigated by hedging and the fact that stable investment grade ratings and excellent payment records allow Colombia to easily access international capital markets. The international liquidity position is sound, with international reserves amounting to more than nine months of import cover, covering the external financing requirement. Official reserves are underpinned by a precautionary IMF Flexible Credit Line, which in June 2016 was renewed and extended to USD 11.5 billion. This precautionary facility provides stronger insurance against heightened external risks. Colombia remains vulnerable to adverse investors’ sentiment due to a relatively large stock of inward portfolio investments at 160% of official reserves. However, the flexible exchange rate serves as a shock absorber, supported by a limited dollarization of the economy and modest external debt. In 2017 a gradual peso depreciation is expected, depending on the timing and the speed of US interest rate increases. Despite significant economic progress in recent years Colombia still has high rates of poverty and inequality, especially in rural areas. In order to achieve sustainable long-term economic growth, job growth promotion, social reforms and infrastructure improvement would be necessary.